Italian niche brand Blood Concept will follow last year's release of four unisex fragrances corresponding to the basic blood types A, B, AB, O with +MA, a new unisex fragrance that reportedly explores the future of mankind. 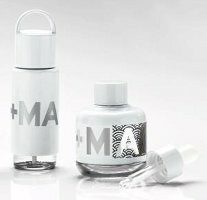 +MA is said to be made with only synthetic ingredients, but without the metallic notes that were used in the blood type series. In the same way plasma is extracted from blood, we pull out all the visceral and dense mood BLOOD CONCEPT has been speaking about, to let a new whiter and ethereal identity take shape. Red fades into White without leaving a trace. This new atmosphere is the cradle of our new scent. Clean as pure air, fresh as clear sheets, this scent releases a safety sensation. Seduction is no more a matter of weapons. Love is no more a battlefield but a silky hug made of white linen. Blood Concept +MA will be available this month, in 30 or 60 ml Drip Spray or 40 ml Dropper. hmm. the future of mankind is fabric softener. Well, hail to our new Snuggle overlords. lol. It made me think of fabric softener as well. I’ve not heard of this brand, but the Blood Concept blood type series sounds interesting. Personal tastes will vary, but I tried all four of the Blood Concept scents and thought O was not terrible (though nothing I’d wear) and the other three were absolutely worthless. I don’t hold out any hope for this one, either. Yeesh, you’d think they could have come up with something better than the same thing everyone else is doing/already has done with the “fresh linen sheets” mess. Like played up the metallic elements, added some grease and rubber and made the press release something about android blood. Hahahaha. Every time Prix Eau Faux rolls around, it starts to feel like the fragrance companies put on a little extra gas to bring it home that we can’t POSSIBLY compete. The Prix Eau Faux is really so much harder than it looks! So Esmé Cullen wears this?